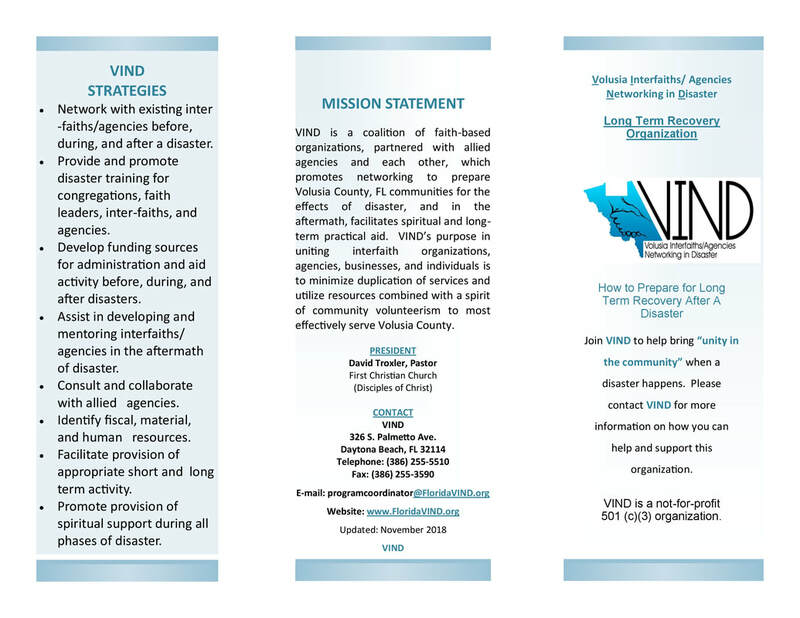 VIND is a coalition of faith-based organizations, partnered with allied agencies and each other, that promotes networking to prepare Volusia County, FL communities for the effects of disaster, and in the aftermath, facilitates spiritual and long-term practical aid. VIND's​ purpose in uniting interfaith organizations, agencies, businesses, and individuals is to minimize duplication of services and utilize resources combined with a spirit of community volunteerism to most effectively serve Volusia County. On a regular basis, we bring together existing inter-faith organizations, religious leaders, non-profits, emergency management and government agencies, community businesses and volunteers to share in the responsibilities of assisting those who have lost shelter, food, clothing and accessibility as a result of various types of disasters. ​The Cost: knowing that many do not have insurance to cover damages, and that disasters create injury, lost of jobs, income and property, our services are given at no cost to the client. 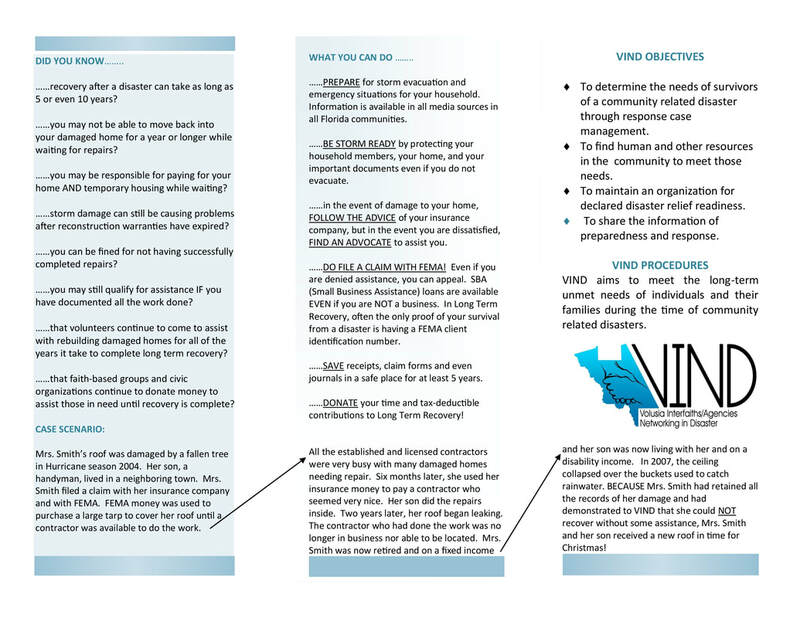 VIND uses case managers to assist those needing assistance as a result of a disaster. Our case managers develop and help implement a recovery plan based on the resources available. They match resources with needs, and will come to your location when help is requested. Also click this to see our Facebook Page! Spectrum and VIND work together to help repair and rebuild a home!!! Diamond Resorts International recently presented a total of $10,000 to the United Way of Volusia-Flagler and to Volusia Interfaiths/Agencies Networking In Disaster. Both are members of the Community Organizations Active in Disasters; each received $5,000. The monies will help to provide assistance to households that had damage or debris from Hurricane Matthew and did not have enough money to meet their insurance deductible or had other needs. Pictured from left are Loretta Wilary, United Way; Brad Leslie and Jason Abdela, Diamond Resorts; Dennis Burns, United Way; John Betros; Diamond Resorts; Pastor David Troxler, Vo lusia Interfaiths/ Agencies and Keri Serrano, Clinton Sode, Kelly Richmond, Michael Mastando and Keith McCloud; Diamond Resorts.